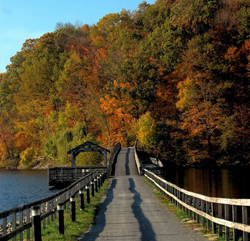 A 4.5-mile trail featuring a 12-footwide, handicapped accessible pavement that follows the Lake Lynn shoreline along an abandoned railroad right-of-way. A nature viewing area is located at the southern tip and a fishing platform near the station is at the northern tip. Children’s playground on Cheat Lake situated next to the 4.5-mile rail-trail. Picnic areas, beach area for swimming, fishing pier, fish cleaning stations and restrooms (seasonal).